RADARKAMPUS.COM, Jakarta – e.COM is an annual event presented by BEST (BINUS English Society), consisting of 7 English competitions: scrabble, spelling bee, speech, newscasting, story writing, storytelling, and debate. Students from various high school and undergraduate university students participated in the competitions, both from national and international institutions. “New Chances, New Wonders” is the theme that is brought up in e.COM 2016, as we aim to open doors of opportunities through the use of English. It is held on the 23rd to the 25th of September 2016 at BINUS International University; Joseph Wibowo Centre and FX Campus. STORYTELLING COMPETITION: Jasmine Gedalya Simamora (1st), Viona Andrea (2nd), Gunawan Tjokro (3rd). SPEECH COMPETITION: Nadia Eliora (1st), Radhy M. Ampera (2nd), Travis Tio (3rd), Bernadine Gracia (4th). SPELLING BEE COMPETITION: Dyah Ayu Megantari Soesetyo Putri (1st), Muhammad Daffa Al-Falah (2nd), Joses Sebastian (3rd). SCRABBLE COMPETITION: M. Rastra Teguh P. (1st), Yuda Eka Prasetia (2nd), Alexander Gozali (3rd), Hartanto Wibisono (4th) and Longest Word by Ario A. Alifianto. 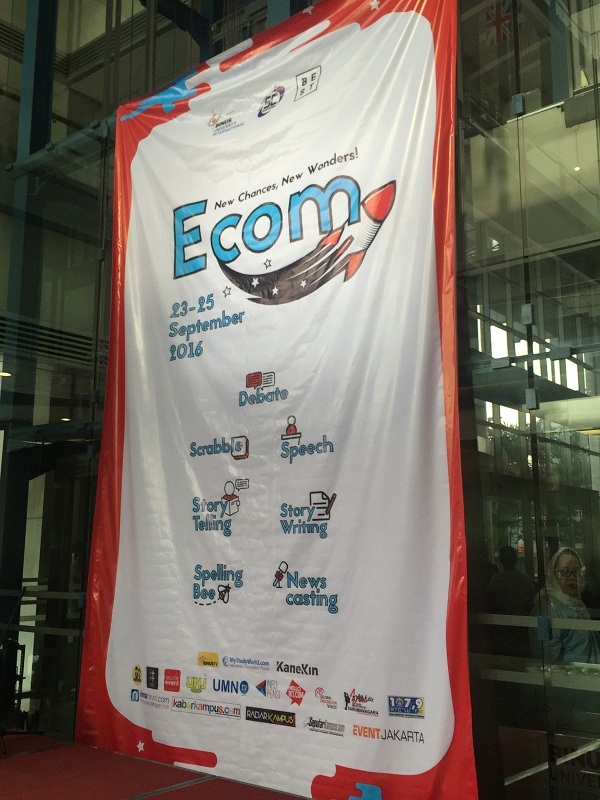 This year’s e.COM would not be possible without the support of Heavenly Blush as our sponsor and these 18 media partners: BINUS TV, UMN TV, Kabar Kampus, Radar Kampus, GIV News, Seputar Kampus, Seputar Event, Radio Untar, Event Jakarta, RTC UI FM, Kanekin, Anak Unpad, Hello Jakarta, My Study World, Inspirator Freak, Info Pensi, UNJ Kita, and RIMA News.